Anxiety disorders are the most common mental illness in the U.S., affecting 40 million adults in the United States age 18 and older, or 18.1% of the population every year according to the Anxiety and Depression Association of America. Stress is such a serious problem that WebMD reports up to 90% of all doctor's office visits are for stress-related ailments and complaints. 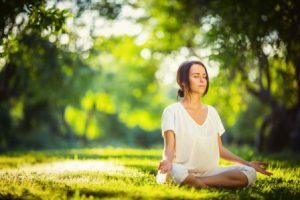 You are no doubt filling prescriptions for anti-anxiety medications, however some naturally-inclined individuals choose not to use drugs and opt for managing their stress through supplements, essential oils, and relaxation techniques. By supplying natural stress relief options, you provide for the needs of all shoppers, both conventional and alternative (and everyone in between!). Here are some ingredients and product types that are trending. CBD is oil that is extracted from hemp plants. However, unlike another oil derived from the same plant – THC – CBD oil does not make a person high. It is purported to help with a variety of conditions and, Epilodex® (GW Pharmaceuticals), a prescription medication containing CBD which treats seizures associated with Lennox-Gastaut syndrome or Dravet syndrome was recently approved by the FDA for use in the U.S. According to non-profit organization, Project CBD, at high concentrations, CBD directly activates the 5-HT1A (hydroxytryptamine) serotonin receptor, thereby conferring an anti-anxiety effect. Interesting science is reported on the Project CBD if you are interested in the topic. Your customers are hearing about CBD everywhere – online, the media, and their friends. Don’t be surprised if they start asking their trusted pharmacist about it, too! Ashwagandha is an herb commonly used in the Ayurveda tradition to boost libido, increase longevity, and fight stress. The way it is thought to work with anxiety is by lowering cortisol levels. Results of this randomized double-blind, placebo-controlled study were positive, and yet some people see no improvement at all. The popular health website Livestrong offers a reminder that there are warnings associated with ashwaganda, such as it can cause miscarriage, induce hypothyroidism in people with thyroid conditions, and can increase the effects of sedatives and barbiturates. Educating yourself on the use of adaptogenic herbs such as ashwagandha can help you counsel patients effectively. B-Vitamins are one segment of vitamins some people may not be getting enough of from diet alone, including vegans and vegetarians. A study in 60 adults with depression showed that treatment with a B-complex vitamin for 60 days led to significant improvements in depression and anxiety symptoms, compared to a placebo. If your shoppers come looking for this, be sure to know the risks and benefits associated with taking a B-complex vitamin. Magnesium has been all over the internet for a while as a substance we are supposedly lacking, and there are a handful of ways people are looking to get this into their bodies. Supplements, both powders, liquids, and capsules, are one way, but there are also Epsom salt baths and topical magnesium which comes in lotion and sprays. Popular TV personality Dr. Oz recommends magnesium for stress, so it is good to be aware of this in case your patients have questions. Flower remedies and homeopathic remedies are other choices natural shoppers turn to for stress relief. You can get a general understanding about the theories behind these types of products by reading this article on Dr. Weil’s website. Dr. Weil himself says he is “not aware of any good studies to support the efficacy of…flower essence[s], but he knows that many people enjoy using them and that they appear to be free of side effects.” You can take a similar approach – you don’t have to necessarily support the science to know they fill a need for certain customers. Essential oils such as lavender are thought of as promoting relaxation when placed in a diffuser. My local independent pharmacy has an entire display of diffusers and various essential oils. It has been a popular expanding area of their business. Here are a few other ways to appeal to natural-minded shoppers. You can offer chair massages or invite an area chiropractor or naturopathic doctor to talk through anxiety-reducing strategies. Have any extra floor space? Consider bringing in a yoga, meditation, or tai chi instructor to conduct weekly classes. I’ve said this before, but it is worth repeating. As a pharmacist, you don’t need to 100% believe in the health benefits each of the above supplements has on the body. If it makes sense to offer these types of supplements based on your customer profile, your job is to learn about stress relief supplements, be aware of what is being said about them in the popular culture, and counsel patients appropriately. It is very important to know about supplement and drug interactions. With every new drug dispensed, taking time to discuss potential supplement or OTC and drug interactions can be important in keeping patients safe and feeling secure.